An additional private IP addresses, known as secondary private IP addresses can also be assigned. Unlike primary private IP addresses, secondary private IP addresses can be reassigned from one instance to another. Each instance assigned a public IP address is also given an External DNS hostname. External DNS hostname resolves to the public IP address outside the network and to the private IP address within the network. In EC2-VPC, multiple private IP addresses can be specified to the instances. Host multiple websites on a single server by using multiple SSL certificates on a single server and associating each certificate with a specific IP address. Operate network appliances, such as firewalls or load balancers, that have multiple private IP addresses for each network interface. Redirect internal traffic to a standby instance in case the instance fails, by reassigning the secondary private IP address to the standby instance. Secondary private IP addresses can be assigned and unassigned to ENIs attached to running or stopped instances. Secondary private IP addresses that are assigned to a network interface can be reassigned to another one if you explicitly allow it. Primary private IP addresses, secondary private IP addresses, and any associated Elastic IP addresses remain with the network interface when it is detached from an instance or attached to another instance. Although primary network interface cannot be moved from an instance, the secondary private IP address of the primary network interface can be reassigned to another network interface. An Elastic IP address is a static IP address designed for dynamic cloud computing. Elastic IP address can help mask the failure of an instance or software by rapidly remapping the address to another instance in your account. However, Amazon imposes a small hourly fee for an unused Elastic IP address to ensure efficient use of Elastic IP addresses. So charges would be applied if it is not associated or associated to an instance in stopped state or associated to an unattached network interface. A primary private IP address. One Elastic IP address per private IP address. One public IP address, which can be auto-assigned to the elastic network interface for eth0 when an instance is launched, but only when elastic network interface for eth0 is created instead of using an existing network interface. ENI can be attached to an instance, detached from that instance and attached to an other instance. Attributes of an ENI like elastic IP address, private IP address follow the ENI and when moved from one instance to an other instance & all traffic to the ENI will be routed to the new instance. Create dual-homed instances with workloads/roles on distinct subnets. ENI can be attached to an instance when it’s running (hot attach), when it’s stopped (warm attach), or when the instance is being launched (cold attach). Secondary (ethN) ENI can be detached when the instance is running or stopped. 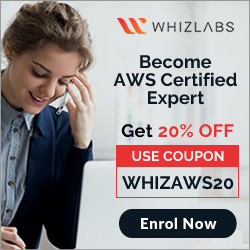 Launching an Amazon Linux or Microsoft Windows Server instance with multiple network interfaces automatically configures interfaces, private IP addresses, and route tables on the operating system of the instance. A warm or hot attach of an additional ENI may require bringing up the second interface manually, configure the private IP address, and modify the route table accordingly. Instances running Amazon Linux or Microsoft Windows Server automatically recognize the warm or hot attach and configure themselves. Attaching another ENI to an instance is not a method to increase or double the network bandwidth to or from the dual-homed instance. Maximum Transmission Unit (MTU) of a network connection is the size, in bytes, of the largest permissible packet that can be transferred over the connection. All Amazon EC2 instance types support 1500 MTU, and many current instance sizes support 9001 MTU, or Jumbo frames. Jumbo frames are Ethernet frames that allow more than 1500 bytes of data by increasing the payload size per packet, and thus increasing the percentage of the packet that is not packet overhead. Jumbo frames should be used with caution for Internet-bound traffic or any traffic that leaves a VPC. Packets are fragmented by intermediate systems, which slows down this traffic. Regarding the attaching of ENI to an instance, what does ‘warm attach’ refer to? Can I detach the primary (eth0) network interface when the instance is running or stopped? By default what are ENIs that are automatically created and attached to instances using the EC2 console set to do when the attached instance terminates? 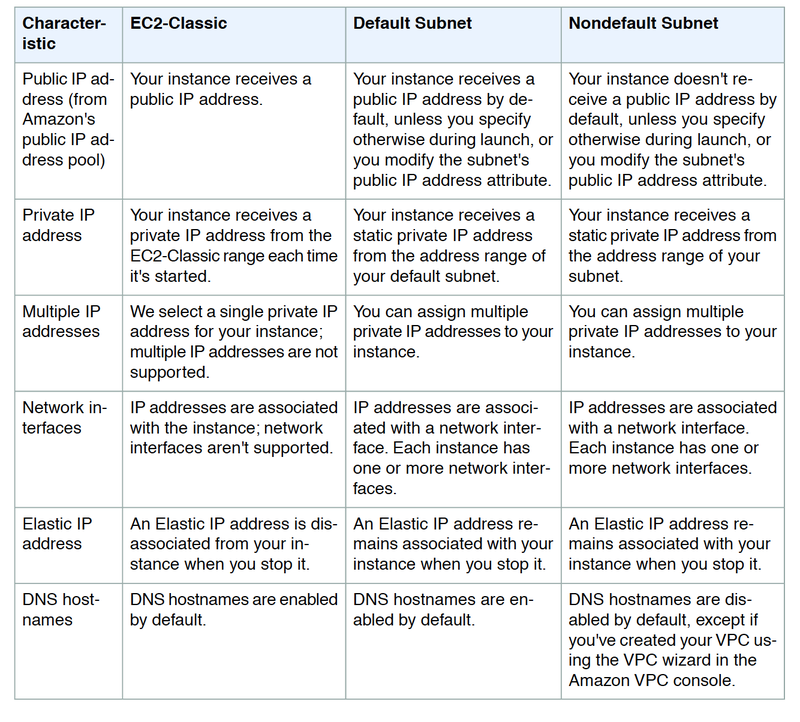 In Amazon VPC, an instance retains its private IP addresses when the instance is stopped. To ensure failover capabilities, consider using a _____ for incoming traffic on a network interface”. A user is planning to host a web server as well as an app server on a single EC2 instance, which is a part of the public subnet of a VPC. How can the user setup to have two separate public IPs and separate security groups for both the application as well as the web server? Launch VPC with two separate subnets and make the instance a part of both the subnets. 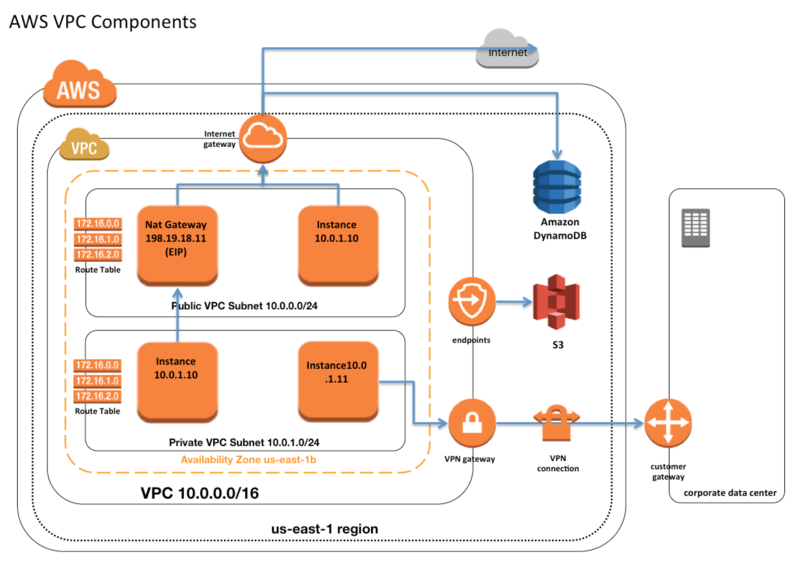 Launch a VPC instance with two network interfaces. Assign a separate security group and elastic IP to them. Launch a VPC with ELB such that it redirects requests to separate VPC instances of the public subnet. An organization has created multiple components of a single application for compartmentalization. Currently all the components are hosted on a single EC2 instance. Due to security reasons the organization wants to implement two separate SSLs for the separate modules although it is already using VPC. How can the organization achieve this with a single instance? Create a VPC instance, which will have both the ACL and the security group attached to it and have separate rules for each IP address. Create a VPC instance, which will have multiple network interfaces with multiple elastic IP addresses. You have to launch two instances each in a separate subnet and allow VPC peering for a single IP. Create a VPC instance, which will have multiple subnets attached to it and each will have a separate IP address. Your system automatically provisions EIPs to EC2 instances in a VPC on boot. The system provisions the whole VPC and stack at once. You have two of them per VPC. On your new AWS account, your attempt to create a Development environment failed, after successfully creating Staging and Production environments in the same region. What happened? You didn’t choose the Development version of the AMI you are using. You didn’t set the Development flag to true when deploying EC2 instances. You hit the soft limit of 2 VPCs per region and requested a 3rd. A user has created a VPC with a public subnet. The user has terminated all the instances, which are part of the subnet. Which of the below mentioned statements is true with respect to this scenario? A virtual private cloud (VPC) is a virtual network dedicated to the AWS account. It is logically isolated from other virtual networks in the AWS cloud. VPC allows the user to select IP address range, create subnets, and configure route tables, network gateways, and security settings. CIDR block once assigned to the VPC cannot be modified. NOTE – You can now resize VPC. 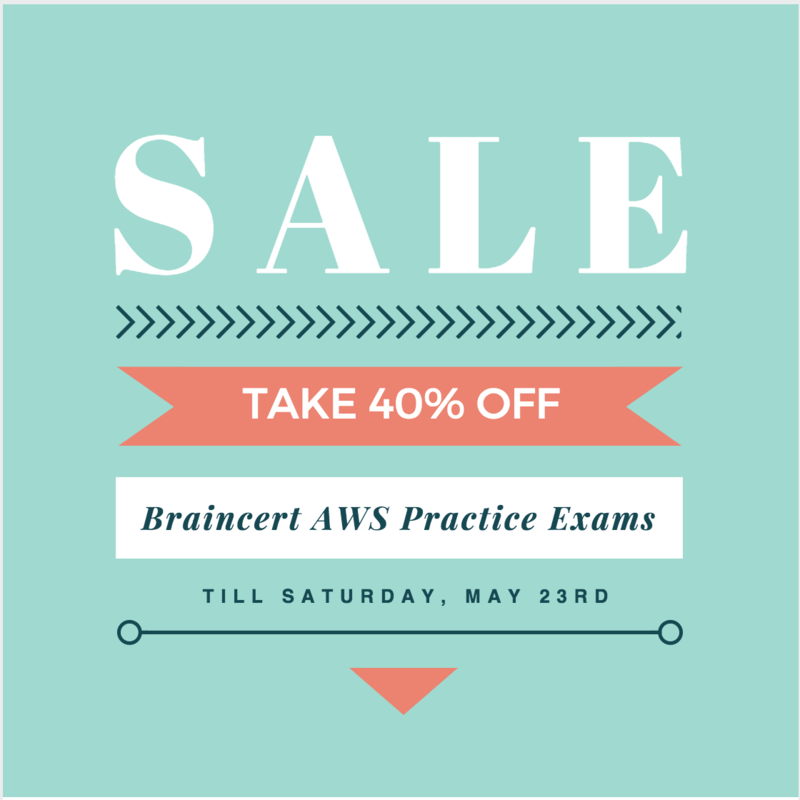 Read AWS blog post. Connection between your VPC and corporate or home network can be established, however the CIDR blocks should be not be overlapping for e.g. VPC with CIDR 10.0.0.0/16 can communicate with 10.1.0.0/16 corporate network but the connections would be dropped if it tries to connect to 10.0.37.0/16 corporate network cause of overlapping ip addresses. Public IP address assignment to the Instance depends if the Public IP Addressing is enabled for the Subnet. Public IP address is assigned from AWS pool of IP addresses and it is not associated with the AWS account and hence is released when the instance is stopped and restarted or terminated. ENI’s attributes follow the ENI as it is attached or detached from an instance and reattached to another instance. When an ENI is moved from one instance to another, network traffic is redirected to the new instance. Create a low-budget, high-availability solution. Route tables needs to be updated to defined routes for Internet gateways, Virtual Private gateways, VPC Peering, VPC Endpoints, NAT Device etc. An Internet gateway is a horizontally scaled, redundant, and highly available VPC component that allows communication between instances in the VPC and the Internet. IGW imposes no availability risks or bandwidth constraints on the network traffic. To perform network address translation (NAT) for instances that have been assigned public IP addresses. NAT device enables instances in a private subnet to connect to the Internet or other AWS services, but prevents the Internet from initiating connections with the instances. Flow logs do not capture real-time log streams for network interfaces. 10.0.0.255: Network broadcast address. AWS does not support broadcast in a VPC, therefore the address is reserved. Each Subnet is associated with a route table which controls the traffic. A user has created a VPC with public and private subnets using the VPC Wizard. The VPC has CIDR 20.0.0.0/16. The private subnet uses CIDR 20.0.0.0/24. Which of the below mentioned entries are required in the main route table to allow the instances in VPC to communicate with each other? A user has created a VPC with two subnets: one public and one private. The user is planning to run the patch update for the instances in the private subnet. How can the instances in the private subnet connect to the internet? The security group of the instance is not configured properly. The instance is not configured with the proper key-pairs. The Apache website cannot be accessed from the Internet. Instance is not configured with an elastic IP. A user has created a VPC with public and private subnets using the VPC wizard. Which of the below mentioned statements is true in this scenario? A user has created a VPC with public and private subnets. The VPC has CIDR 20.0.0.0/16. The private subnet uses CIDR 20.0.1.0/24 and the public subnet uses CIDR 20.0.0.0/24. The user is planning to host a web server in the public subnet (port 80) and a DB server in the private subnet (port 3306). The user is configuring a security group of the NAT instance. Which of the below mentioned entries is not required for the NAT security group? A user has created a VPC with the public and private subnets using the VPC wizard. The VPC has CIDR 20.0.0.0/16. The public subnet uses CIDR 20.0.1.0/24. The user is planning to host a web server in the public subnet (port 80) and a DB server in the private subnet (port 3306). The user is configuring a security group for the public subnet (WebSecGrp) and the private subnet (DBSecGrp). Which of the below mentioned entries is required in the web server security group (WebSecGrp)? A user has created a VPC with CIDR 20.0.0.0/16. The user has created one subnet with CIDR 20.0.0.0/16 by mistake. The user is trying to create another subnet of CIDR 20.0.0.1/24. How can the user create the second subnet? A user has created a VPC with public and private subnets using the VPC wizard. The VPC has CIDR 20.0.0.0/16. The private subnet uses CIDR 20.0.0.0/24 . The NAT instance ID is i-a12345. Which of the below mentioned entries are required in the main route table attached with the private subnet to allow instances to connect with the internet? A user has created a VPC with CIDR 20.0.0.0/16 using the wizard. The user has created a public subnet CIDR (20.0.0.0/24) and VPN only subnets CIDR (20.0.1.0/24) along with the VPN gateway (vgw-12345) to connect to the user’s data centre. The user’s data centre has CIDR 172.28.0.0/12. The user has also setup a NAT instance (i-123456) to allow traffic to the internet from the VPN subnet. Which of the below mentioned options is not a valid entry for the main route table in this scenario? A user has created a VPC with CIDR 20.0.0.0/16. The user has created one subnet with CIDR 20.0.0.0/16 in this VPC. The user is trying to create another subnet with the same VPC for CIDR 20.0.0.1/24. What will happen in this scenario? A user has created a VPC with CIDR 20.0.0.0/16 using the wizard. The user has created both Public and VPN-Only subnets along with hardware VPN access to connect to the user’s data centre. The user has not yet launched any instance as well as modified or deleted any setup. He wants to delete this VPC from the console. Will the console allow the user to delete the VPC? A user has created a VPC with the public and private subnets using the VPC wizard. The VPC has CIDR 20.0.0.0/16. The public subnet uses CIDR 20.0.1.0/24. The user is planning to host a web server in the public subnet (port 80) and a DB server in the private subnet (port 3306). The user is configuring a security group for the public subnet (WebSecGrp) and the private subnet (DBSecGrp). Which of the below mentioned entries is required in the private subnet database security group (DBSecGrp)? Allow Outbound on port 3306 for Destination Web Server Security Group (WebSecGrp. A user has created a VPC with a subnet and a security group. The user has launched an instance in that subnet and attached a public IP. The user is still unable to connect to the instance. The internet gateway has also been created. What can be the reason for the error? A user has created a subnet in VPC and launched an EC2 instance within it. The user has not selected the option to assign the IP address while launching the instance. Which of the below mentioned statements is true with respect to the Instance requiring access to the Internet? A user has created a VPC with public and private subnets using the VPC wizard. Which of the below mentioned statements is not true in this scenario? A user has created a VPC with the public subnet. The user has created a security group for that VPC. Which of the below mentioned statements is true when a security group is created? A user has created a VPC with CIDR 20.0.0.0/16 using VPC Wizard. The user has created a public CIDR (20.0.0.0/24) and a VPN only subnet CIDR (20.0.1.0/24) along with the hardware VPN access to connect to the user’s data centre. Which of the below mentioned components is not present when the VPC is setup with the wizard? A user has created a VPC with public and private subnets using the VPC wizard. The user has not launched any instance manually and is trying to delete the VPC. What will happen in this scenario? A user has created a public subnet with VPC and launched an EC2 instance within it. The user is trying to delete the subnet. What will happen in this scenario? A user has created a VPC with CIDR 20.0.0.0/16. The user has created public and VPN only subnets along with hardware VPN access to connect to the user’s datacenter. The user wants to make so that all traffic coming to the public subnet follows the organization’s proxy policy. How can the user make this happen? A user has created a VPC with CIDR 20.0.0.0/16 using the wizard. The user has created a public subnet CIDR (20.0.0.0/24) and VPN only subnets CIDR (20.0.1.0/24) along with the VPN gateway (vgw-12345) to connect to the user’s data centre. Which of the below mentioned options is a valid entry for the main route table in this scenario? A user has created a VPC with CIDR 20.0.0.0/24. The user has created a public subnet with CIDR 20.0.0.0/25. The user is trying to create the private subnet with CIDR 20.0.0.128/25. Which of the below mentioned statements is true in this scenario? A user has created a VPC with CIDR 20.0.0.0/16 with only a private subnet and VPN connection using the VPC wizard. The user wants to connect to the instance in a private subnet over SSH. How should the user define the security rule for SSH? A company wants to implement their website in a virtual private cloud (VPC). The web tier will use an Auto Scaling group across multiple Availability Zones (AZs). The database will use Multi-AZ RDS MySQL and should not be publicly accessible. What is the minimum number of subnets that need to be configured in the VPC? Instances in a private subnet can communicate with the Internet only if they have an Elastic IP. The Internet Gateway (IGW) of your VPC has scaled-up adding more instances to handle the traffic spike, reducing the number of available private IP addresses for new instance launches. AWS reserves one IP address in each subnet’s CIDR block for Route53 so you do not have enough addresses left to launch all of the new EC2 instances. AWS reserves the first and the last private IP address in each subnet’s CIDR block so you do not have enough addresses left to launch all of the new EC2 instances. AWS reserves the first four and the last IP address in each subnet’s CIDR block so you do not have enough addresses left to launch all of the new EC2 instances. A user wants to access RDS from an EC2 instance using IP addresses. Both RDS and EC2 are in the same region, but different AZs. Which of the below mentioned options help configure that the instance is accessed faster? You can associate multiple subnets with the same Route Table. You can associate multiple subnets with the same Route Table, but you can’t associate a subnet with only one Route Table. You can’t associate multiple subnets with the same Route Table. You need to design a VPC for a web-application consisting of an ELB a fleet of web application servers, and an RDS DB. The entire infrastructure must be distributed over 2 AZ. Which VPC configuration works while assuring the DB is not available from the Internet? You have an Amazon VPC with one private subnet and one public subnet with a Network Address Translator (NAT) server. You are creating a group of Amazon Elastic Cloud Compute (EC2) instances that configure themselves at startup via downloading a bootstrapping script from Amazon Simple Storage Service (S3) that deploys an application via GIT. Which setup provides the highest level of security? You have launched an Amazon Elastic Compute Cloud (EC2) instance into a public subnet with a primary private IP address assigned, an internet gateway is attached to the VPC, and the public route table is configured to send all Internet-based traffic to the Internet gateway. The instance security group is set to allow all outbound traffic but cannot access the Internet. Why is the Internet unreachable from this instance? The Internet gateway security group must allow all outbound traffic. The instance security group must allow all inbound traffic. The instance “Source/Destination check” property must be enabled. You have an environment that consists of a public subnet using Amazon VPC and 3 instances that are running in this subnet. These three instances can successfully communicate with other hosts on the Internet. You launch a fourth instance in the same subnet, using the same AMI and security group configuration you used for the others, but find that this instance cannot be accessed from the internet. What should you do to enable Internet access? Deploy a NAT instance into the public subnet. Configure a publically routable IP Address in the host OS of the fourth instance. Modify the routing table for the public subnet. The security groups or network ACLs are not property configured for web traffic. The load balancer is not configured in a private subnet with a NAT instance. The VPC does not have a VGW configured. When will you incur costs with an Elastic IP address (EIP)? When an EIP is allocated. When it is allocated and associated with a running instance. When it is allocated and associated with a stopped instance. Costs are incurred regardless of whether the EIP is associated with a running instance.